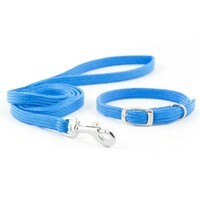 Ancol Puppy and Small Dog Collar and Lead Set offers owners the perfect starter collar and lead for their new pet! The supple, soft-weave fabric of this stylish blue collar ensures the most comfortable fit for your pup. This collar is fully adjustable to fit growing puppies and small dogs with a collar size of 20 - 30cm. Included in this set is a lead and a collar.